I just cannot tell you how happy I am to have my daughter home for the summer. It is such a blessing that she is becoming one of my best friends and she brightens the house with her presence. We have a ton of creative projects planned for the summer. We’ve started sewing and stitching already and this afternoon includes a trip to the nursery to start a garden overhaul. Every big job is so much better when you have four hands instead of two. Today on the Lily Bee blog, I’m sharing this layout as a second take on the Lily Bee Sketch Challenge #9. We’d love to have you play along. Check it out! 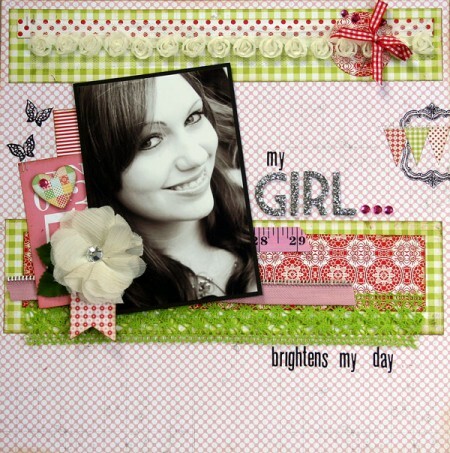 This entry was posted in Lily Bee, Scrapbooking, sketches. Bookmark the permalink. I’m happy for you that you are spending the summer with your beautiful daughter. The layout is gorgeous. Have a wonderful time. Beautiful LO!! So many pretty colors next to the black and white pic really makes it pop. Your daughter is so gorgeous! Your daughter is beautiful, as is the layout. How wonderful that you have that special mother daughter friendship. Thanks for sharing. What a lovely layout!! Your daughter is so pretty – like her mom :). Sounds like you will have a wonderful summer! so glad you two have this time together, what a special layout to remember this time. My daughter is moving a 21 hour drive away from us at the end of this summer so I am hoping to spend alot of time this summer with her!